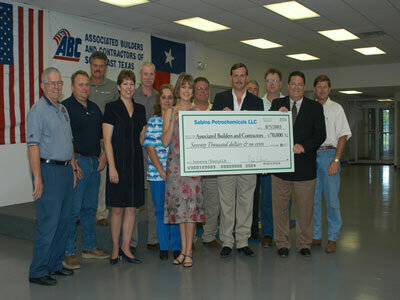 On May 16, 2006 ExxonMobil celebrated the commissioning of the Beaumont Cogeneration Project, and as part of that celebration, Refinery Manager, Lori Ryerkerk (pictured below) made a check presentation to the ABC Construction Training Center in the generous amount of $150,000.00. This donation will be applied toward the construction of new classrooms at the Training Center, as well as the purchase of lab equipment. ABC appreciates ExxonMobil’s continued support of the Training Center, its students, and all of Southeast Texas. ABC would like to thank both, Mr. Derek Murray, Territory Manager of DeWALT and Mr. Philip Drago, II, Branch Manager of Drago Supply Co., Inc. for their generous donation of “120 Zirconium and Aluminum Oxide Grinding Wheels and new safer flap wheels” to the Construction Training Center. Our Welding and Pipefitting students will certainly put this equipment to good use, and it is a great addition to the Welding and Pipefitting Labs. Many thanks to everyone involved, not only for their generosity and time, but their commitment to ABC and its students as well; it is appreciated! For more information about these two companies, their services and products, visit www.dewalt.com and www.dragosupply.com. 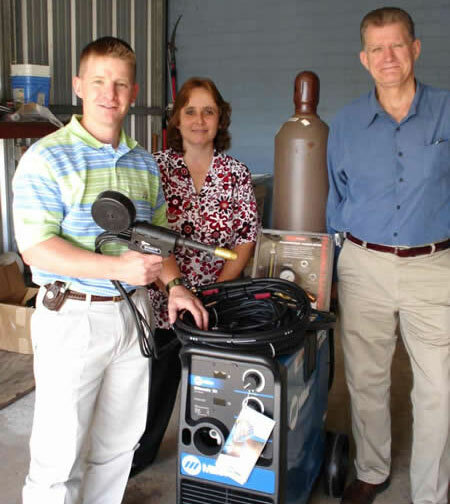 ABC would like to thank Mr. David Jones, Region Manager-Southeast Texas and Louisiana, and Inez “Snoopy” Mauboules, both of Matheson Tri-Gas for the generous donation of a Millermatic 251 MIG Welding Machine (with accessories) to the Construction Training Center. Additionally, a special thank you to Mr. Sid Tweedle, District Manager of Miller Electric Mfg. Co., for his willingness to discount the equipment to Matheson Tri-Gas in order to help make this type of donation possible. 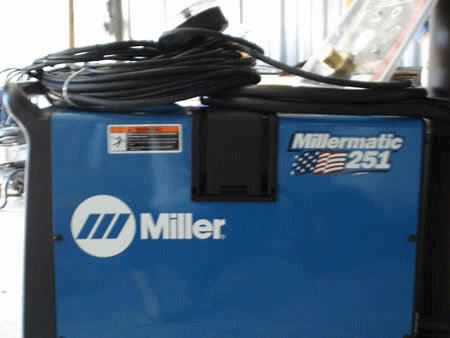 This Millermatic 251 MIG Machine is just the latest in a series of donations given and arranged by Matheson Tri-Gas and Miller Electric Manufacuturing Co. This MIG machine is a great addition to our Welding Lab and will help enable our instructors to teach the students various welding techniques in heavy and light carbon steel and alloy fabrication. Many thanks to everyone involved, not only for their generosity and time, but their commitment to ABC and its students as well; it is appreciated! For more information about these two companies, their services and products, visit www.matheson-trigas.com and www.millerwelds.com. 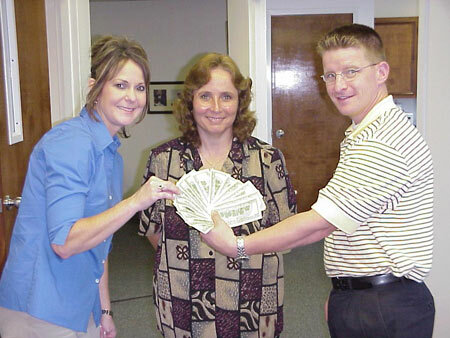 Sid Tweedle of Miller Electric Manufacturing Co.
On October 25, 2004, David Jones, Regional Manager and Inez “Snoopy” Mauboules, both of Matheson Tri-Gas both presented the ABC Training Center with $1,500.00 in Cash Raffle Proceeds as a result of their purchase and “Raffling-Off” of a Miller Bobcat 225 amp AC/DC Welding Machine--10,000 Watt Generator at ABC’s Outdoor Extravaganza held on September 16 th. The Training Center will certainly be able to put this money to good use for Welding supplies and equipment for the students. Our sincere appreciation and thanks to Matheson Tri-Gas, its managers and employees, for their continued participation, support and generosity of ABC. ABC would like to thank Mr. David Jones and Ms. Snoopy Pollock, both of Matheson Tri-Gas for the generous donation of a SD180 Tig/Stick Welding Machine to the Construction Training Center’s Pipefitting Lab. This equipment is valued at approx. $2,100.00, and will certainly be put to good use by our students. Visit www.matheson-trigas.com for more information about this company, its products and services. Also, a special thank you to Mr. Sid Tweedle of Miller Electric Manufacturing Co. for his willingness to always work with Matheson Tri-Gas and its employees to make these types of donations possible. His continued involvement, support and generosity of the school and students are appreciated. 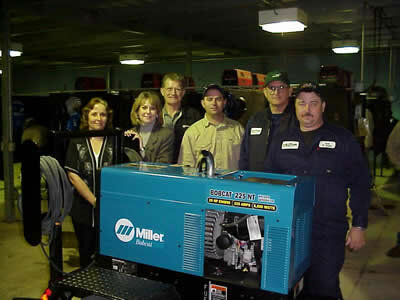 Visit www.millerwelds.com for additional information about Miller Electric and its products. 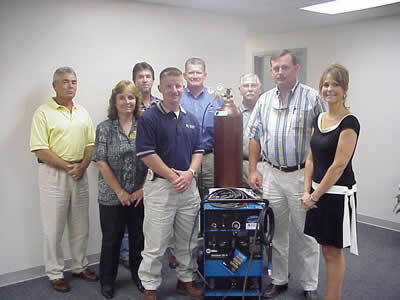 David Jones, Inez “Snoopy” Pollock, and Kyle Onstott all of Matheson Tri-Gas; Sid Tweedle of Miller Electric Manufacturing; ABC’s Past Chairman of the Board, Rickey Simmons of Triple “S” Industrial; and ABC’s President, John Bernard; Director of Education, Kimberly Bernard; and Training Coordinator, Gene Russell. ABC would like to thank Mr. Sid Tweedle of Miller Electric Manufacturing Co. for the generous donation of a new Plasma Arc Cutting Machine and a “Patriotic Welding Hood” to the Construction Training Center 's Welding lab. This equipment and hood are valued at over $3,500.00, and will certainly be put to good use by our students. 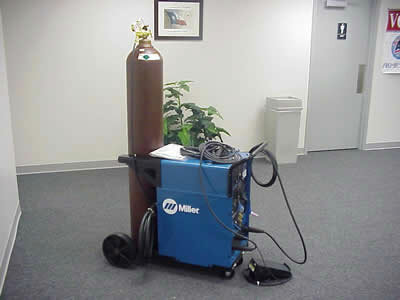 Visit www.millerwelds.com for more information about Miller Electric and its products. Also, a special thank you to Ms. Inez “Snoopy Pollock of Matheson Tri-Gas who was very instrumental in soliciting and coordinating this donation for the Training Center . Matheson Tri-Gas, a valued ABC member, also donated various welding items to ABC's Instructors and students. Visit www.matheson-trigas.com for additional information about Matheson Tri-Gas, its products and services. Many thanks to everyone involved, not only for their generosity and time, but their commitment to ABC and its students as well; it is appreciated! Pictured in the photos below, Sid Tweedle of Miller Electric Manufacturing; Inez “Snoopy” Pollock, David Jones, Cecil Cunningham, Tony Parsley and Kyle Onstott all of Matheson Tri-Gas; ABC's Board of Directors, Director of Education and Welding Instructors. 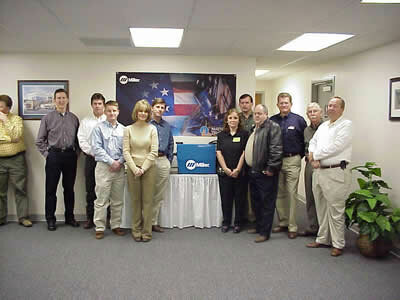 On August 5, 2003 Sabina Petrochemicals L.L.C. 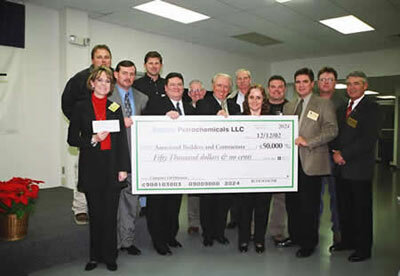 announced another donation of $70,000 to fund an Instrumentation and Electrical lab for students at Associated Builders & Contractors of Southeast Texas. 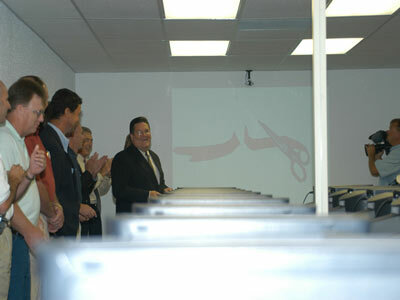 The announcement was made at the ribbon-cutting ceremony for ABC’s new computer lab, which was funded with a donation of $50,000 from Sabina Petrochemicals in December 2002. Sabina has donated a total of $120,000 to fund both labs in addition to donating a total of $30,000 for full scholarships for local residents and to support ABC’s craft training facilities. 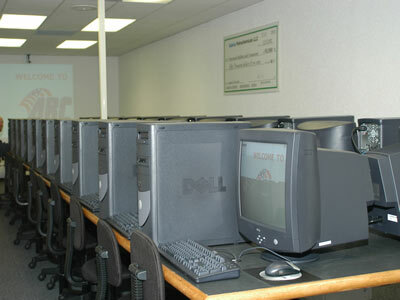 ABC’s new computer lab includes 20 Dell computer stations and the latest teaching software for students to use in the school’s craft training center. Mark Viator, manager of human resources and community affairs for Sabina Petrochemicals, said that support of ABC’s training programs is part of the company’s commitment to education and the community. Sabina Petrochemicals L.L.C. is a joint venture between Shell Chemical LP, BASF Corporation and ATOFINA Petrochemicals, Inc., to build and operate a world-scale Integrated C4 Olefins complex. The new facility is being constructed adjacent to the BASF FINA Petrochemicals Limited Partnership’s naphtha steam cracker. More than 700 construction workers are currently employed at the site. ABC would like to thank the Sabine-Neches Coating Society for its generous donation of $1,800.00 to the Construction Training Center for the purchase of Industrial Painting curriculum. 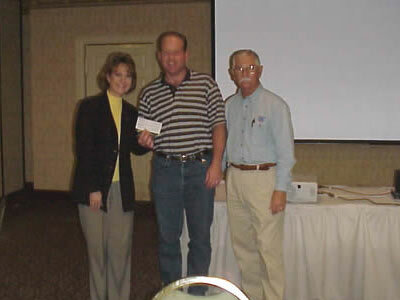 The check was presented on Tuesday, March 25, 2003 at the Society’s monthly meeting. (Pictured in the attached photo is from left to right: Kimberly Walston, Director of Education, Brian McGee, of Plasite Chandelle Company and Gene Russell, ABC’s Training Coordinator). Thanks again to all the members of the Sabine-Neches Coating Society for their generosity and support of ABC, it is appreciated! Students at Associated Builders & Contractors, Inc. of Southeast Texas Training Center in Nederland will have the latest computer learning technology available to them, thanks to the donation of a new computer laboratory by Sabina Petrochemicals LLC. Rudi Schnur, Vice President of Petrochemicals of BASF Corporation and President of Sabina Petrochemicals LLC in Port Arthur, announced the gift at ABC’s December 12th Fall Graduation ceremony. The $50,000.00 laboratory will include 20 computer stations with the latest teaching software; this will enhance ABC’s ability to train many of the skilled industrial and construction workers in the Southeast Texas area. The organization’s 2 to 4 year curriculum provides training in Welding, Pipefitting, Electrical, Instrumentation, Millwright, Industrial Painting, Industrial Insulation and Industrial Carpentry. Graduates in the program go on to work in the area’s key industries. ‘Quality Jobs’. We give our students the education and training they need to compete for quality jobs created by industry”, said Kimberly Walston, ABC’s Director of Education. 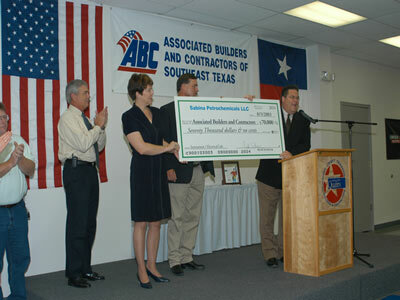 “BASF and Sabina Petrochemicals have been major supporters of ABC and have played an important role in helping us perform our mission of training Southeast Texans for careers in the construction and industrial fields and we are extremely grateful for their continued support of our program and students”, said Walston. Sabina Petrochemicals LLC is a joint venture between Shell Chemicals, BASF Corporation and ATOFINA Petrochemicals, Inc. to build and operate an Integrated C4 Olefins complex. The Port Arthur facility operates a steam cracker, which turns naphtha and light hydrocarbons into ethylene, propylene, and other chemical raw materials. The products from the cracker are in turn used in the manufacture of hundreds of consumer products. The $1 billion facility began operations in 2001. More than 200 workers are employed at the site. President/CEO, John Bernard and the Director of Education, Kimberly Bernard. ABC Dedicates New Welding Lab on Tuesday, October 30th. Through the generosity and monetary donations of BASF Fina Petrochemicals, L.P., Lincoln Electric, Matheson Tri-Gas, and various other ABC contractor and supplier members, Associated Builders & Contractors Construction Training Center of Southeast Texas is pleased to announce the grand opening and dedication of its newly constructed and renovated Welding Lab. Kimberly Walston, Director of Education, stated "with the addition of the 16 new welding booths, ABC will now be able to accommodate 54 welding students per night, as well as enhance the quality of our existing program. The outfitting of the new lab with Lincoln Electric's latest technology in welding equipment will also give our students the advantage of being familiar and proficient with this equipment when they graduate and go into the field as certified welders." Additionally, this equipment can be set up to do MIG (Metal Inert Gas) Welding where we have identified a demand for this process in the manufacturing industry. Should the need arise ABC has the capability to add another 16 welding booths to accommodate training for area industrial expansion. ABC would like to thank Mr. Chuck Mazoch of Coastal Welding Supply, Inc. for the generous donation of four Weldmark Burning Rigs to the Construction Training Center's Welding lab. This equipment, valued at over $1,000.00, will certainly be put to good use by our students. Mr. Leroy Fagg of Larco Industries, Inc. (pictured below), was also very instrumental in obtaining this donation for the Training Center. Thanks to both of these ABC members for their generosity and time, it is appreciated! 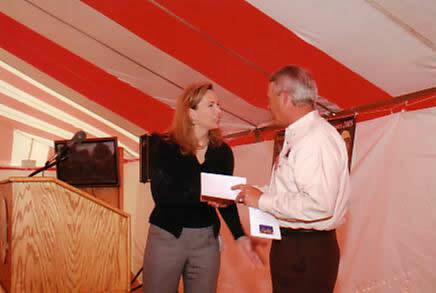 Kimberly Bernard, ABC and Leroy Fagg, Larco Industries, Inc.